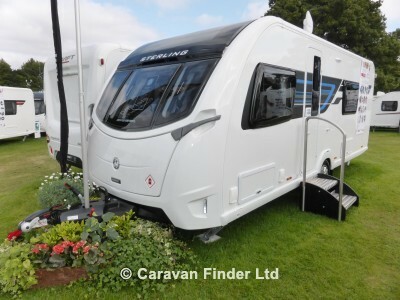 THIS IS OUR DISCOUNTED PRICE REDUCED FROM OUR FORECOURT PRICE OF £18995 AND IS AVAILABLE ONLINE AND ONSITE.THE CARAVAN WAS REGISTERED NEW IN MARCH 2017 AND COMES WITH ITS REMAINING FACTORY WARRANTY OF INTERIOR APPLIANCES UNTIL MARCH 2020 AND EXTERIOR WATER INGRESS UNTIL MARCH 2023. THIS IS THE TOP OF THE RANGE FIXED SINGLE BED LAYOUT FROM THE INDUSTRY'S LEADING MANUFACTURER SWIFT AND HAS COMPLETELY TIMBERLESS BUILT CONSTRUCTION. THE MOST LUXURIOUS CARAVAN IN THE SWIFT RANGE. VIEWING HIGHLY RECOMMENDED.